Leo April 2016 Horoscope foretells that career and personal achievements are important which in turn will improve your family relationships. Your social contacts and your spouse will be encouraging your career efforts. 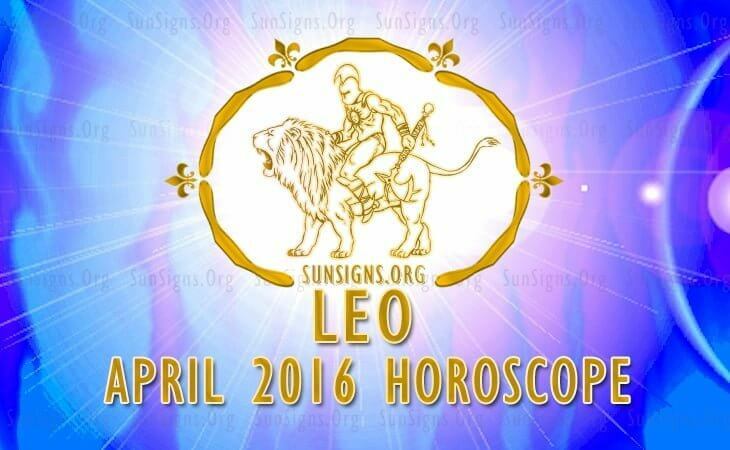 In April 2016, Leos will have to use their charm and grace for progressing in life. Collaboration and conciliation are major necessities than personal initiative and independence. The Solar eclipse of the 19th April will have a major impact on the personal outlook of the lions and the Leo personality will undergo a major transformation after proper assessment. Leos, you have to review your priorities in career and pay attention to a couple of those. You will be showered with rewards and recognition accompanied by promotions and increments. Be prepared for career changes and organizational modifications after mid April 2016. Career progress depends on your social contacts when you face problems at the work place. The April 2016 Leo astrology forecasts suggest that finances will become normal during the month. Your financial skills are excellent and money can be made while you are assisting others to flourish financially. You can use your surplus to clear pending loans. There is no problem raising money for your business activities in April2 016. Overseas ventures will give good returns during the second half of the month. The month is ideal for introducing vital changes in your fiscal strategies. The 2016 love predictions for the Leos suggest that your emphasis on career may impact your love life during April 2016. Relationship with your spouse or partner will be pleasant. Your partner should learn to give you more freedom to follow your interests for a compatible marriage. Harmony between love, profession and spiritual areas of life is vital for a peaceful life. The arrival of a child will bring happiness in your lives. The Leo health will be outstanding till the 20th April. But you need to be mentally and physically fit after that. You will be associated with important ventures in April 2016 and you must have the necessary energy to execute those activities. You should try out the health benefits of natural foods and habits. It is advisable to avoid foreign travel during the first and last weeks of the month. To conclude, the April 2016 Leo horoscope predicts that this month will be a fulfilling month both on professional and personal fronts.